When visiting the Acropolis you most probably will come up the hill from Monastiraki. Theorias is the name of the street that goes around the Acropolis, north to south-west. At the beginning of Theorias you will find an little spot on your right that gives you a nice view over Athens. A little further on your left is the Metamorphosis Church. Keep going up hill and soon you will come to the rock of Areios Pagos (Supreme Court) on your right. Be very careful when climbing the stone-cut steps leading up the rock because they are extremely slippery. So is most of the top of the rock. Wear shoes with rubber soles as leather ones might very well get you to the hospital rather then to the top of the Areios Pagos. You can avoid this by taking the safe metal stairs. Do not go up the rock during the warmest part of the day as you will not be able to stay up there for long. This Hill of the Supreme Court was the seat of the supreme court of ancient Athens. Kings of Mycenaean rule are buried in long tombs along its flank. The apostle Paul came here in the year 50 AD and the tablet imbedded in the stone on the right side of the bottom of the rock contains his words. Nearby is the little basilica dedicated to St. Dionysus the Areios Pagite, one of Paul's first converts. Once you are on top of the rock of Areios Pagos, you have an excellent view over the ancient agora, Plaka, Monastiraki, Omonia, Syntagma and most of the rest of Athens. Lots of people will be on the rock at dusk as you have a great view on the Athens sunset there. At night couples go up to enjoy the lights of the city...... but mostly, to enjoy each other of course. Athens wouldn't be Athens without the holy rock, the Acropolis. Turn a corner in a modern, car free, shopping street and you will see the Acropolis. 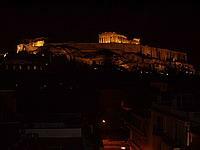 Sit on a cosy outside terrace on a warm summer evening and the Acropolis will be there, all lit. You just must see the Acropolis but visit it in the morning when it is not too warm yet as it is a pretty healthy climb to the entrance. The Propylaean, the Temple of Athene Nike, the Parthenon, the Erechtheion, the Arrephorio and much more will take you back in time to the Greek Gods, to Perikles, Iktinos and Pheidias. Visiting the Acropolis museum right behind the Parthenon isn't possible any longer. It closed in July 2007 and the ancient works of art were moved to the new Acropolis museum. You will see the most bizarre translations for the word Acropolis, some are even funny. Acropolis actually means "edge of the city". At last! The sacred rock is finally also accessible to physically disabled people. In fulfilment of the commitment made to the European Union and the International Olympic Committee and with the approval of the Central Archaeological Council, the Hellenic Ministry of Culture, following a Ministerial decision, has assured access to the Acropolis via a lift on the north slope of the Sacred Rock (above the Kanellopoulos museum). The lift is vehicle and wheelchair accessible via an entrance just north of the main entrance to the Acropolis. A moving platform takes you from the level of the promenade to the lift cabin. On top of the Acropolis, a platform and inclined ramp lead from the lift to the flat area northwest of the Erechteion. For the tour of the monuments, specially surfaced paths have been laid out from the northwest of the Erechteion to the northwest corner of the Parthenon from where there is a clear view of the eastern facade of de Propylaea. At the northeast corner of the Parthenon, the path curves towards the Acropolis museum. From there you have a good view on the eastern side of the Parthenon and on the ruins of the Temple of Augustus and Rome. A small vertical lift takes you into the courtyard of the Acropolis museum that is closed now due to the move of hundreds of invaluable works of arts to the new Acropolis Museum. In order to avoid heavy crowds, wheelchair visitors are advised to visit the Acropolis during off-peak hours (08:00-10:00 & 13:00-17:00). No doubt Athena is smiling down upon this new access to the Acropolis as will be all physically disabled people who can now also visit the sacred rock. Thank you Hellenic Ministry of Culture! On the very east side of the Acropolis there is a high pole, the Greek flag in top. When, during World War II, the Germans occupied Athens, they ordered Konstantinos Koukidis, the Evzone who guarded the flag, to take it down. The Evzone obeyed, calmly took the flag down, wrapped himself in it and jumped from the Acropolis to his dead. Apostolis Santas and Manolis Glezos were two eighteen year-old Greeks know by Greeks as well as Europeans. On the night of 30 May 1941 they tore down the Nazi Flag flying from the Acropolis. It inspired the Greeks and resistance to Nazi oppression rose in all of Greece. The plaque on the foot of the flagpole, commemorates the courageous act of Santas and Glezos. The latter became a member of the resistance. He was sentenced to death for treason in 1948 and imprisoned for being a communist. Later, Glenzos became a member of PASOK, the Socialist Party. Every day at 06:30, a detachment of the Greek infantry raises the Greek flag at the Acropolis. At sunset, you will find another detachment of the same infantry in front of the Acropolis entrance to go up and take the flag down again for the night. On Sunday, this tradition is carried out by the Evzones. Founded in 1985, the Technological Educational Institution of Athens (TEI) is Greece's only educational institution in tertiary education offering a degree in the conservation of antiquities and works of art. Approximately 90 students enrol annually completing a four-year program. Besides their multi-disciplinary education - which includes courses in history of art, conservation theory, documentation methods, chemistry, biology and physics - these students must possess precision and patience, two skills rarely associated with today's fast-paced world. Greek monuments that have undergone the TEI's special treatment include the prehistoric trunks of Lesvos' unique petrified forest, statues at Athens First Cemetery, religious paintings and icons from Aghios Nikolaos Ragavas, Aghia Erene, the Monastery of Aghia Ekaterina Sina, archaeological finds and works that belong to the National Gallery.